Antonio Conte has warned Chelsea they must overhaul their squad if they are to improve on this season - whether or not he is sacked as head coach. Captain Gary Cahill led the calls for clarity over Conte's position last night, with the Italian waiting to find out if he will lose his job, despite securing some consolation for missing out on the Champions League by beating Manchester United in the FA Cup final, thanks to Eden Hazard's penalty. 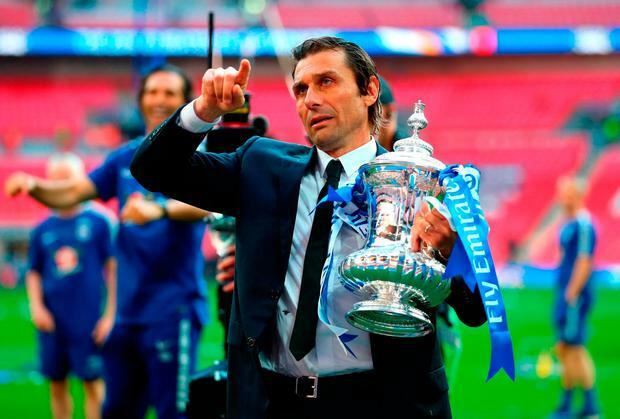 Conte, who has won the Premier League and FA Cup during his two seasons in charge, says he will not quit but his stormy relationship with the Chelsea board over their transfer strategy has meant his position has been in doubt since the start of his second season. As the Chelsea board deliberate his future, the Italian has told the club that an overhaul of the playing staff is required no matter who is in charge, with a summer of upheaval ahead. Owner Roman Abramovich, whose application to renew his UK visa was delayed yesterday, also has decisions to make over the futures of star man Hazard and goalkeeper Thibaut Courtois, who yesterday admitted he did not know if he had played his last game for the club. But the first decision will be about Conte who, when asked if he could have tried harder to enjoy a more stable relationship with his Chelsea superiors, answered: "It's not simple to answer this question. "For sure, when you decide to take a coach like me, you must know who you are taking, who you are charging for this job. "I repeat, I cannot change my personality, I cannot change my idea of football. I can find the right way to win this trophy, for sure. "If you ask me if we can play better then, yes, we can play better. But now the real situation of this club is this: we have to play strong defensively if you want to win a trophy or to get a place in the Champions League. "Maybe we missed the Champions League this season because we tried to play very open and in this moment you can't do this, especially with a strong team because to concede three goals in seven games means you don't have stability. A great team doesn't concede three goals or four goals against Watford. "Then, against Manchester United, it was the only way to lift a trophy. Now we are in this moment and if you want to change then we can change our idea, but you must change many players. Understand?" Conte reiterated the fact that he will not quit and save Chelsea a compensation bill worth up to £9 million, hinting that he turned down offers to leave last summer and during this season. Chelsea have been linked with a number of potential successors to the Italian, including Luis Enrique, Maurizio Sarri, Leonardo Jardim and Max Allegri, and Cahill believes the club need clarity over their head coach one way or another. "The uncertainty needs to be put to bed," he said. "That is obvious to everybody. What I can say is that the players do not have any impact on that situation. "I am sure the manager will make the best decision for himself and his family and the club will make the best decision what they feel. I am not dodging the question. "If the manager stays next year, then he stays on next year. If he doesn't then he has gone away with a Premier League and an FA Cup. That is something that everyone at the club can be proud of." Conte once again suggested that the Blues have not matched his own ambition in terms of signings, leaving him an uphill battle to clinch silverware. "As you know, every season I have to speak with the club and also in the last season after we won the League, we spoke," said Conte. "We spoke with the club and we tried to find the right way to try to defend our title. "But as you know it's not simple and sometimes you can have not always the same ambition. But when I decided to sign a new contract, I decided to stay at this club and work very hard for this club. "I must be honest in this season the mountain to climb was very high, very high, very high, but, despite this, we finished by lifting an important trophy, the FA Cup. "We must be pleased because when you win in a difficult season like this, it means there is a great work behind, a great commitment of my players and then we will see." Conte is due to travel back to Italy to be present for his former player Andrea Pirlo's tribute game at the San Siro today and would not reveal when he is scheduled to speak with Chelsea about his future. "I think that this is a private conversation," he said. "It will be a private conversation with the club and I think it's right to be private, and not to tell to the press. It's right to have a private conversation with the club." 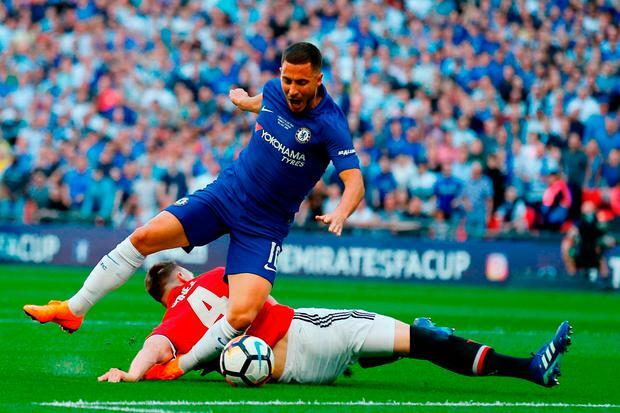 The FA Cup is Cahill's seventh winner's medal with Chelsea and the central defender believes the victory over United highlighted the club's success. "Whatever people say, we have done it again," said Cahill. "Yes we would have liked the Premier League. It was not to be. Man City were a different class this season. "We would have liked to have been in the Champions League positions, which I am sure that we will be back into. "But surely you are judging careers, judging clubs over what they win over periods of years. "You judge players week in and week out and form can be up and down.